I just submitted this photo to Shorpy.com, my favorite web site, and figured I’d post it here, too. 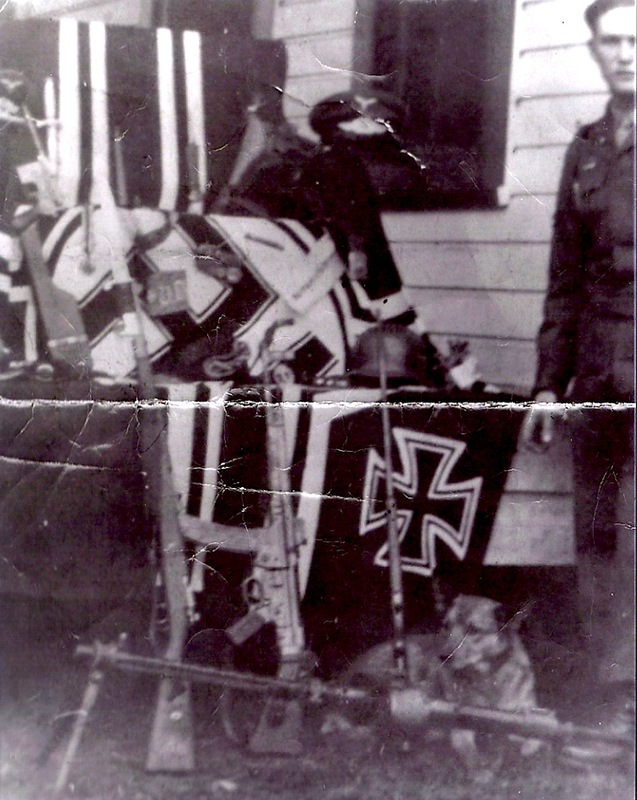 My dad served with the 82nd Airborne in WWII, and sent home an enormous batch of trophies, as seen in this photo taken on the front porch of our family farm after the war. Many of these guns, flags and uniforms were loaned to a museum in Fernandina Beach, Florida, and went astray. We were able to recover a few of them in the early 1970s and the automatic-weapon stamps from the ATF cost us a fortune; I believe it was $500 per gun. You should have seen it when the Naples police chief, my mom, two of my friends and I carried this stash of weapons into the Bank of Naples to store in their safe-deposit vault! My dad even brought back that dog in the photo; her name was Beulah. 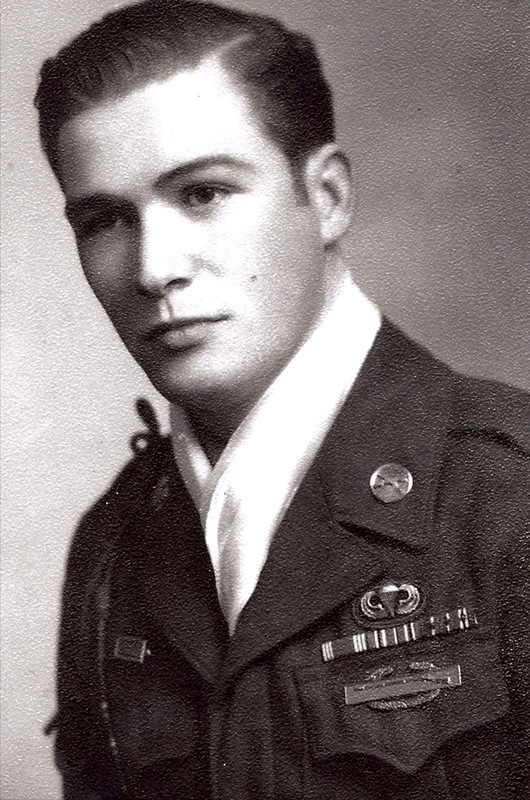 Here’s a photo of Dad showing the campaign ribbons and such that he had earned in that war. I guess he was about 21 years old in this photo taken after the war. My grandmother had an 8″ x 10″ glossy of the following Associated Press photo on the wall in her den. It shows my dad in WWII; she also had the yellowed newspaper clipping which identified him in the photo. Its headline, I remember, was Local Trooper Advances Under Enemy Fire. 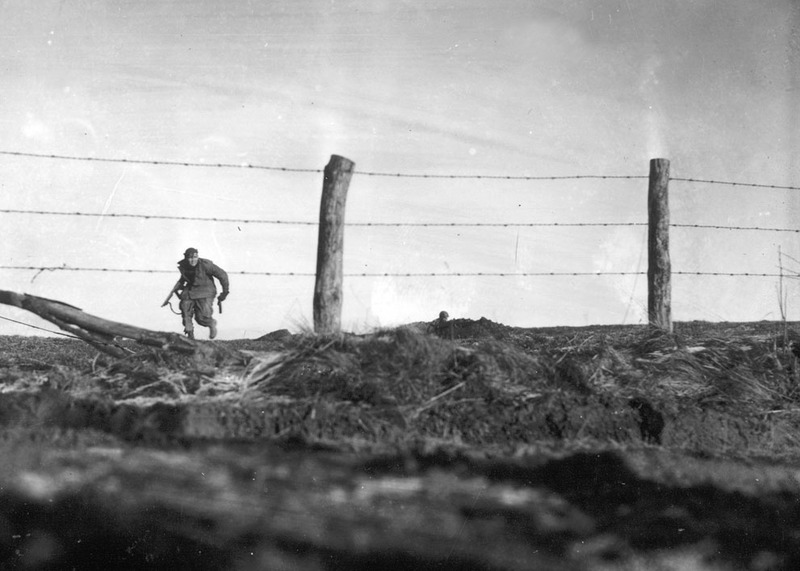 The three-week battle, of which the above photo illustrates one brief moment, was later called the Battle of the Bulge or the Ardennes Offensive; one of the last desperate efforts of Nazi Germany to survive. I think that’s a Thompson submachine gun in one of my dad’s hands; those might be wire cutters in the other. Pretty grim situation for a kid just out of his teens. No helmet, either. No one likes to wear a helmet on Christmas Eve.